SMELLS NO-MORE™ ODOR ELIMINATOR IS A MUST FOR THE ELIMINATION OR REMOVAL TOUGH DOG URINE & CAT URINE ODORS! 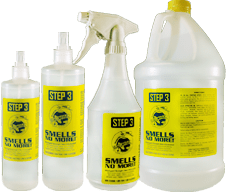 Smells-No More™ Odor Eliminator will permanently get rid of the urine odors in your home or business by completely eliminating urine odor caused by dog urine, cat urine, human urine. Great for your carpets, floors, couches, walls, bedding and more. Smells No More™ Odor Eliminator is not a mask, but an odor eliminator. Smells No-More™ Odor Eliminator is nontoxic, nonstaining, and its uses are endless, including; laundry additive, removing litter box odors, smelly shoes, etc. Smells No-More™ Odor Eliminator is a must for the elimination of ANY and ALL Urine and other odors! As is the case with all of Planet Urine products, no harmful or harsh chemicals are used in this product. Important Pet Housetraining Tip: If you are cleaning Carpet, Hardwood, Tile & Grout, Uphostery, etc, do not use this until AFTER you have used Planet Urine’s UrineOut™ Powder to REMOVE the urine and stains. Learn more about UrineOut™ Powder. After you’ve cleaned the areas and removed the urine, use the Smells No-More™ Odor Eliminator to remove lingering “scents” to help keep your pet(s) from re-soiling in the areas you’ve cleaned. This is very helpful to completely house train your pet(s). Does that make sense? Eliminates dog urine, and cat urine scent so your pet will not re-urinate in same area after cleaning! Smells No-More™ Odor Eliminator is the first and only non-scented, stockyard strength deodorizing spray safe enough for everyday use in house training pets, cleaning litter box odors, cleaning urine soiled fabrics, etc.